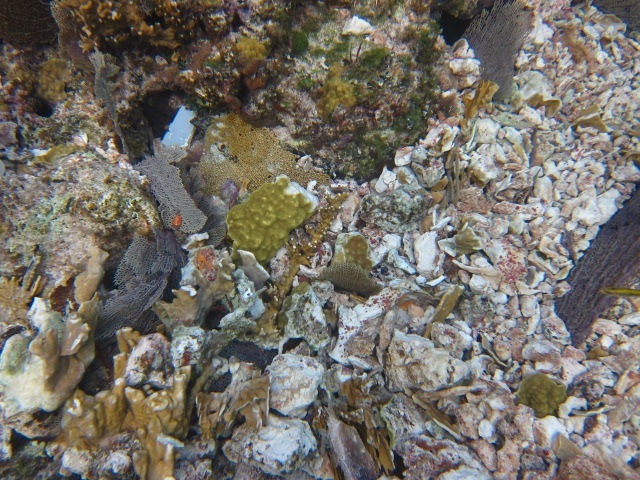 A glimpse of the healthy coral life on the reef crest between Guana and Fowl Cay. 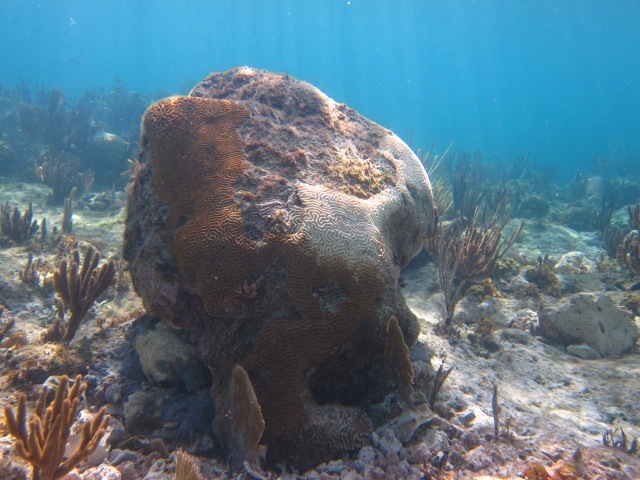 The effort to rescue corals and prevent further reef damage at the vessel grounding site between Guana and Fowl Cay has continued since the accident occurred 3 weeks ago. 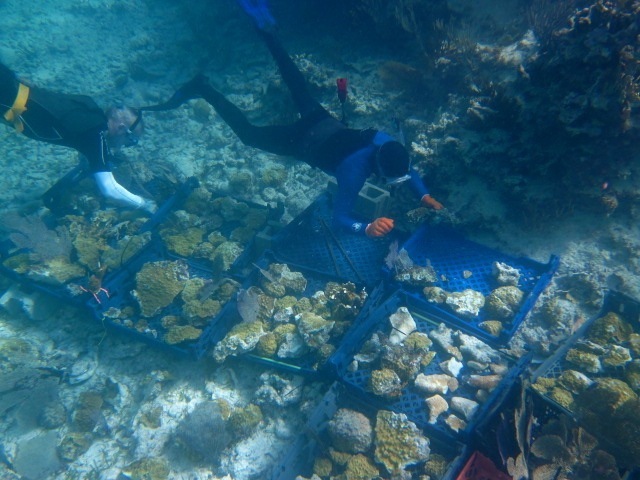 Volunteers from the EHCP, Dive Exuma, and the cruising community have saved literally hundreds of corals and removed a significant volume of loose rubble from the site in hopes of preventing more damage to the reef. 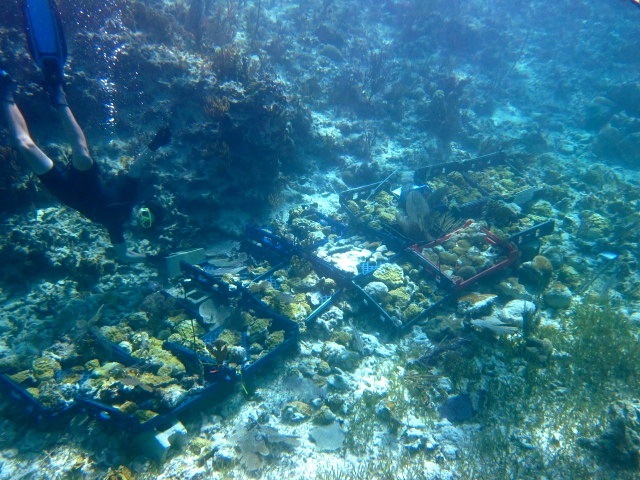 A close up of the rubble and coral fragments the volunteers searched through to rescue corals. 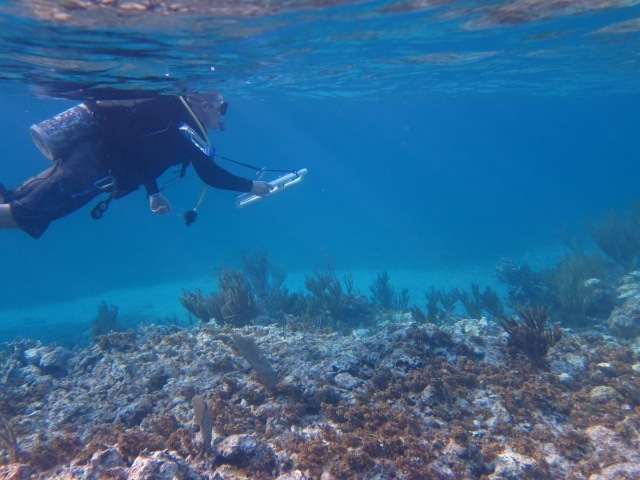 Dr. Robin Smith, a Plant A Fish Ambassador and Director of Science Under Sail estimates that 500 square meters of reef (5000 square feet) was impacted by the grounding. Volunteers righted and cemented one of the large brain corals that was knocked over back to the reef. Bleached (white) tissue is visible where the brain coral sat upside down. A exact count of the number of corals saved is pending, but a conservative estimate would be around 300. An estimated 1200+ lbs of rubble have been removed from the reef crest. Although, most of the bigger pieces of rubble were moved, there is a lot more that will need to be removed before the re-planting stage of the restoration can begin. Robin estimates the extent of the damage. 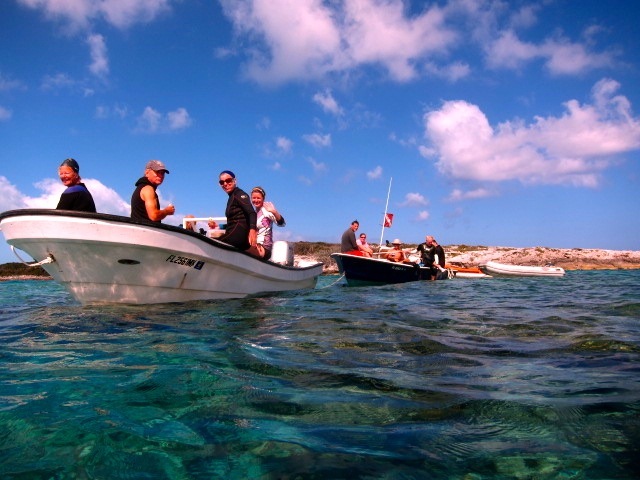 Bill Eklof (m/v Margaret Lee) swims with handfuls of rubble over the scoured reef. 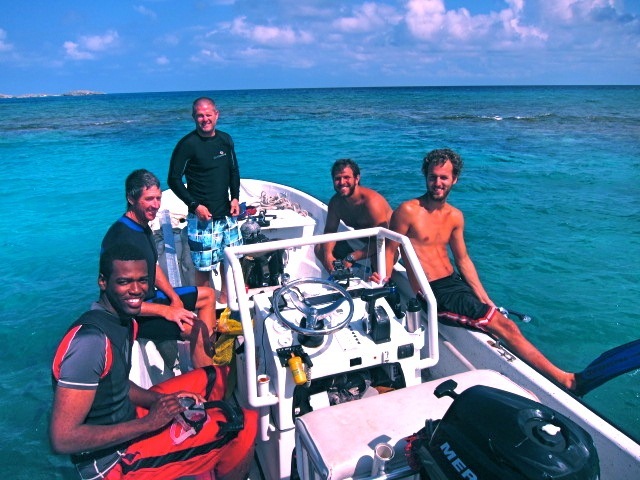 Doug Daggett (s/v Viento) and Jack Hayden (s/v Taiga) put corals into “hospital beds”. Erik Mortenson (s/v Flying Free) diving down to the greatly expanded “triage area” at the end of his second day volunteering. As this reef restoration project develops, it will be very important to acknowledge and address the reasons for navigational errors that lead to incidents like this in the heavily trafficked Elizabeth Harbour. In this case, unfamiliarity with the area and dependence on misleading chart software were the main causes of the accident, but other groundings in the harbour may be attributed to inadequate navigational aids. A screenshot of the Navionics App clearly showing a route between Guana and Fowl as a entrance into Elizabeth Harbour. Howard, Allen, Robin, Jeremy, and Austin. Cruising community volunteers after a strenuous morning of snorkeling for a cause. 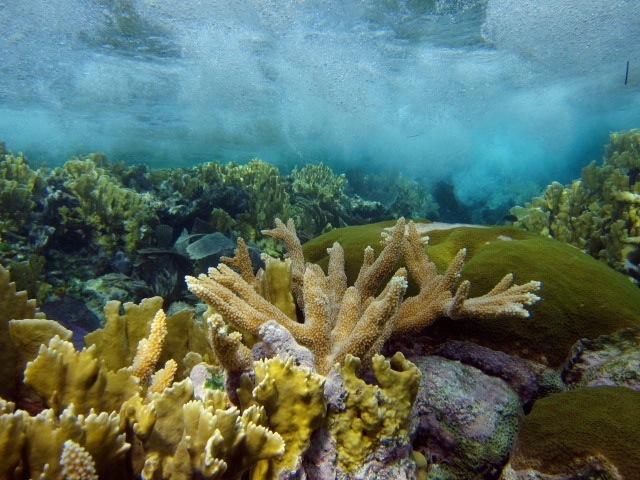 This entry was posted in reef restoration and tagged corals, reef, volunteers. Bookmark the permalink.